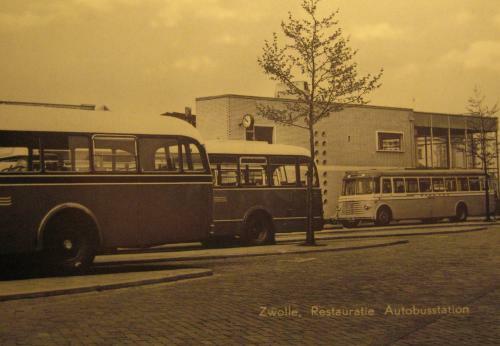 Postcard NL-2104782 from the Netherlands shows restoration of the Zwolle Station with bus and train services, circa. 1954. Zwolle is the capital of the province of Overijssel, the Netherlands. More recently, the station underwent a major renovation in 2000, which resulted in an increased capacity among the effort to overhaul the entire public transportation systems in the city to serve the bus and train passengers better. Zwolle was built on a hill overlooking four rivers: the IJssel, Vecht, Aa and Zwarte Water. It has a long history dated back to the Bronze Age period while the city as it is now known was founded around 800 A.D. The compact old city was surrounded by a star-shaped moat traversed by the Zwarte Water which means black water. Zwolle residents were known as Blauwvingers (Bluefingers) from a folk story dated back to 1682 when the St.Michael's church tower collapsed. The city government was short on cash and had to sell the church bells to neighbouring city Kampen. However, Kampen residents found out the bells were too damaged to be played, after agreeing a high price. In revenge, Kampen residents paid in copper coins of four duiten (the equivalent of 2.5 cents). Distrusting Zwolle people went through a rigorous counting to make sure that they got paid in full. As a result, their fingers had turned blue from the copper after counting this vast amount of coins. The following video on YouTube shows that Zwolle is really a charming city.